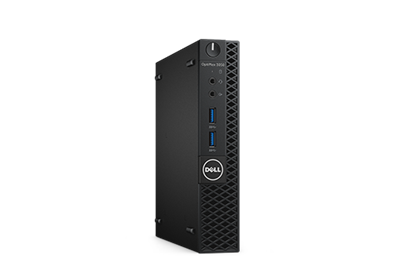 Dell OptiPlex 3050 Micro: Bigger performance, smaller design. Ultra compact business desktop with multiple mounting options to best fit your workspace. Offers essential best-in-class security and manageability. Innovative design: With several custom designed mounting solutions, including the New OptiPlex Micro All-in-one Stand with cable cover, you can free yourself from desktop clutter, maxing out on your productivity potential in a visually appealing work space set up. Compact without compromise: Native support for dual display and designed to pack business-class performance into the smallest possible format. Now utilizing 60% less surface area while still maintaining all the reliability you’ve come to expect. Service with ease: Tool-less serviceability and in-band management enables accessible system maintenance so you can more easily upgrade and replace components. More powerful than ever: Designed around Intel® 7th Gen 35W processors with support up to Core™ i5. Amplify your performance: Supports up to 32GB of the latest 2133MHz DDR4 memory for smoother graphics and less visual stutter. Secure and seamless: Work confidently with unhindered data transfers and smooth connectivity with plenty of port options, including DisplayPort, HDMI, and optional VGA or serial port. A partner you can trust: MTBF Certified, the OptiPlex 3050 delivers the reliability and consistency your work demands. Always up to date: Every OptiPlex 3050 is available with Dell Command Suite, making driver, BIOS, and firmware updates easier. These free tools allow flexible and automated BIOS or system configurations for your company, allowing you to manage your fleet easily and securely every time. Stay secure: With TPM, optional chassis intrusion, HDD Protection, and DDPE, you can focus more on your work and spend less time worrying about your system. 1 x SSD 128 GB - 2.5"